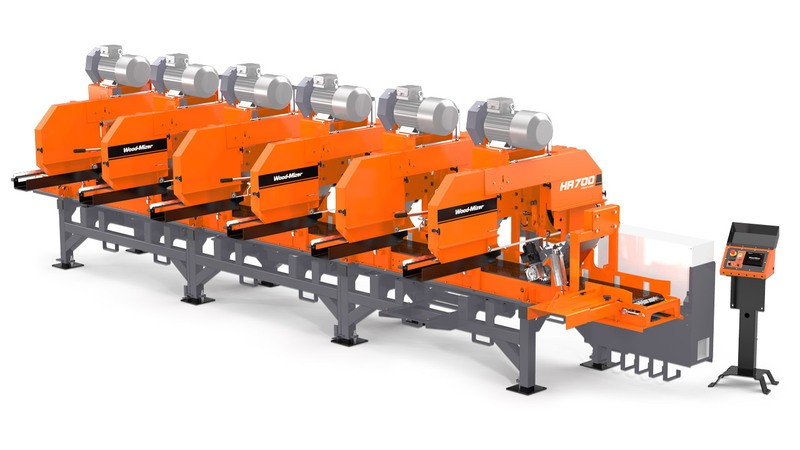 Ideal for companies that need a large capacity, heavy-duty multi-head resaw, the HR700’s modular design makes it easy to expand from one to a maximum of six heads as their demands change. In its maximum six head configuration, the HR700 converts large cants into six boards and one slab in one pass. A separate control stand holds all controls for the resaw. Standard, head height is positioned with a manual screw. Optional Setworks with electric up/down are available, which increase speed and precision when adjusting the heads to produce different sized timber. Centralised blade tensioning for each two-head base makes the blade change process more efficient. The twin-track steel belt conveyor provides a solid and durable surface that fully supports the entire cant width. Heavy, powered rollers stabilise and feed the cants through the heads during sawing. This makes it easier to process short cants or material with internal tension. A pneumatic sensor automatically raises the rollers to accommodate incoming cants. The roller speed is synchronised with the conveyor belt speed, providing more precise cutting, especially for thin boards. The base HR700 module includes two heads as standard. To extend the resaw, all that is needed is to add another two-head module and install a longer conveyor belt. The modular design makes transportation easier and less costly, as well as giving businesses the option to scale up their resaw capability as their demands change. Larger motors and 400 mm x 400 mm cant capacity. Start with the 2-head base and extend with additional modules later. Supports the full cant width. Designed to secure cants with internal tension firmly. Each module has centralised blade tension and lubrication. Increase operator productivity with the optional computer setworks and electric up/down. "When the WM1000 came out, everyone in the slab industry was really excited—it is an affordable, quality, great production mill for a medium volume business..."